In light of a new game that has recently dropped for the Nintendo Switch, I thought I would talk about a character that is gaining a lot of buzz. Arms, a fighting game for the Nintendo Switch where the characters use their extendable arms to fight seems to be hitting the web running. The character I’m talking about in particular is Twintelle. What makes Twintelle stand out from the other playable character in Arms is that her weapon is her hair; dual weaponized ponytails to be exact! Twintelle and her weaponized hair gained a lot of buzz because of many reasons, but the two that sticks out to me are: she is a woman of color (She’s black to me!) and her hair is a source of her power. If you don’t know or like to tune out the world sometimes, I get it believe me I do, allow me to fill you in something: black hair is always a subject for debate. In a society, and world, where European or Western beauty standards reign supreme, black hair that doesn’t naturally conform is considered unprofessional or ugly. As a black woman who rocks an afro or puffy twists on a regular basis, it’s hard waking up some days and reading yet another story about someone getting fired for having dreadlocks or black schoolchildren being told to chemically straighten their hair or that their braids/cornrows, styles used to protect or manage black hair, need to be taken out because they cause a distraction or look unkempt. It’s especially hard seeing the exact same styles that black people get criminalized or judged for on other races and they don’t receive the same backlash. Heck, some magazines even had the audacity to take black hair styles and rename them and call them stylish or chic! I can go on and on about the issues and such that happen when you bring up black hair and black culture, but we’ll save that for another day. 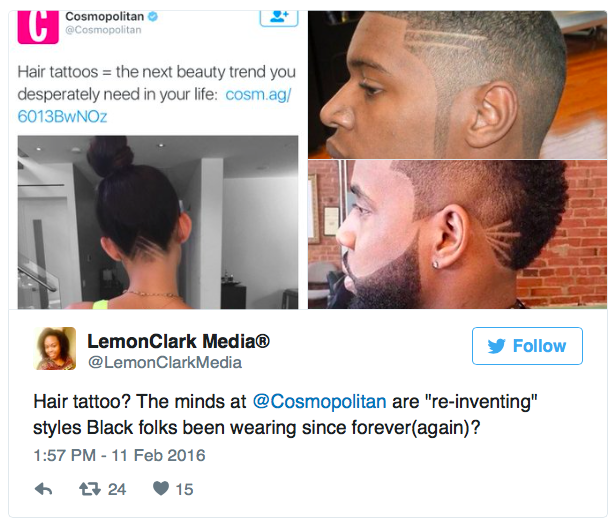 In the world we live in, black hair is always seen as a negative of some sort. It has to be a certain way or style to be digestible; read that as straight. Having black hair or black hair styles only seem cool when you see someone who isn’t black rocking them and that can be pretty disheartening. Here is where Twintelle comes in. In the trailer I saw that focused solely on her, she blew me away from the moment I saw her hands resting confidently on her wide hips. Here you have this seemingly black woman, BEAMING with all the self-confidence and swag in the world; her ponytails out in front of her, armed and ready to wreak havoc. To some, this can be taken the wrong way and seem like her hair, as a passing black woman, is weaponized in an aggressive way. Black women already have it tough, always being seen as angry and armed with a clap back for no reason, so why bring her hair into that negative fold when hair in general on black women is already tough? I get that, I do, but let’s look at it from another light. Twintelle’s hair is weaponized but it doesn’t have to be a bad thing. If Arms was an RPG, I could get in-depth about her personality and her way of speaking, but this isn’t that kind of game so I can’t tell you about what she said during a cut scene that made me love or hate her, but what I can tell you is what I see. I see a woman, who looks like me or any other black woman, who is confident and proud; her hair being a sign of her inner strength and a source of her power. To me, she is no different than seeing a black woman with her hair in an afro or dreads. It’s not a political statement on purpose, it’s just a statement; a sign of pride and black girl magic. Beauty and strength comes in many forms and black hair shouldn’t be excluded from that list. 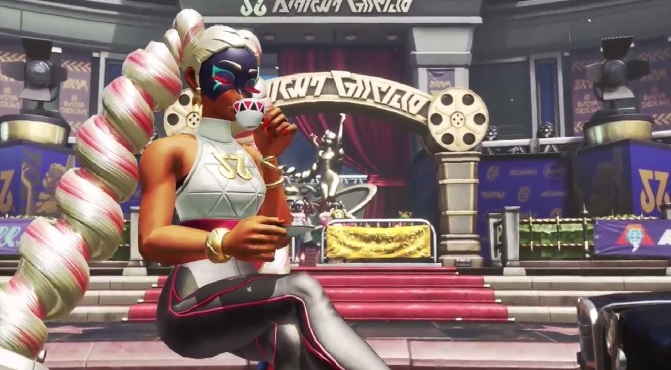 If you think I’m reaching at this point, saying Twintelle is black or how her hair is “black hair”, you might be right. I could be reaching or making a huge deal about something insignificant as a video game character. But let me give it to you straight, this is a lot more than just video games and hair styles. It’s about representation and feeling included. In the nerd realm, representation across various forms of media and entertainment is slim. As far as gaming goes, in my opinion, Overwatch is one of the few games that stick out for truly representing various kinds of people without being too tone deaf or ignorant. Whether or not Nintendo knew what they were doing by having a dark-skinned woman with ponytails for weapons, but they started a conversation that needed to happen. Aside from the obvious need for more black women video game characters, preferably in the protagonist role, the conversation is that hair is more than just hair. To some people it’s a source of identity, a political statement, pride, comfort, and value. Twintelle, whether on purpose or not, is a decent representation on how black women and their hair should be viewed; powerful, dynamic, edgy, strong, confident, unapologetic, and most importantly beautiful. She shows that hair can be just hair or it can be a source of your inner and outer black girl magic. It’s as someone said in one of the Facebook groups I’m in, I wish I had a black girl with her hair as a weapon when I was growing up. Not because my hair is violent or I’m aggressive, but because my hair is an elegant knockout…just like me and Twintelle. She has *blue* eyes, and orange-ish skin, drinks tea from a tea cup, speaks with a accent that is blend of French and Latin, and her theme music sounds like a mix of 70’s pop music with subtle Latin beats in it. It seems to me she’s Half-French Half-Spanish. And its very possible for People of Color to have these features as well as be of French and Latin descent. Michael Ealy and Steven Belafonte have blue eyes, just in case you needed a reference. Honestly, I think Twintelle has more of an olive complexion, supported by the fact she speaks French and is in a France-inspired level. But her identity is ambiguous enough not to matter. She is a successful Nintendo character, with her own movie company in the world of ARMS. I think that people offended by her design are looking to be offended. Everything about her in the game and promotional material portrays her in a positive light. She is my favorite ARMS character.